Welcome to our blog where we happily share ideas about using beads in Girl Scout Craft Projects and provide quality supplies for your beaded craft activities. You can conveniently shop at our online store at www.BeadBee.com. 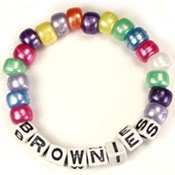 Brownies can create their own adorable alphabet bead friendship bracelets that spell "BROWNIES". This is simple and quick craft project that Brownies can make themselves and wear with pride.They are also are great for swaps and pen pal gifts. These pretty bracelets are made with pearly plastic beads and plastic alphabet strung on stretch cord. Creating stretch bracelets are convenient because they are one-size-fits-all and don't require fancy clasps or tools, simply tie a double knot to finish the bracelet. Alphabet beads and numbers are great for creating customized craft projects. In addition to bracelets, you can also create key chains, necklaces, book marks and other crafts. If you have other ideas or want to spell other words or incorporate your troop number, please let us know, we would love to working with you to customize a bead project for your Girl Scouts. Bracelet kits can be purchased online at BeadBee.com - click here for more details. Share craft ideas, resources and receive special offers from Bead Bee. We can help with crafts and swaps for group activities, games, themes, special ocassions & more.